Justification: lettering and context from similar finds (Matthaiou). Chios . Perhaps found in the 1940s or 50s by N.M. Kontoleon, but not published at that time. Now in Chios Museum (inv. no. MX 1036). Stele, heavily damaged and broken on all sides except for the back and a portion of the left. Edition here based on Matthaiou 2006: 103-111, with ph. figs. 1-2, and including preliminary notes and readings by Kontoleon and Forrest. Cf. also: SEG 56, 997. This fragmentary inscription is sufficiently preserved to suggest that it was either a general regulation concerning a priesthood, or perhaps a contract for the sale of this office, two types of documents which are regularly found in Chios during the 5th and 4th centuries BC. For a general priestly contract, see e.g. CGRN 36; for sales, see e.g. CGRN 37. The fragments of the regulation appear to propose different scenarios under which the priest receives certain sets of perquisites: perhaps a missing list of portions above (lines 1-2); then, when a foreigner wishes to sacrifice (lines 3-10); finally, the fragment concludes with another hypothetical case, now lost (lines 10-13). 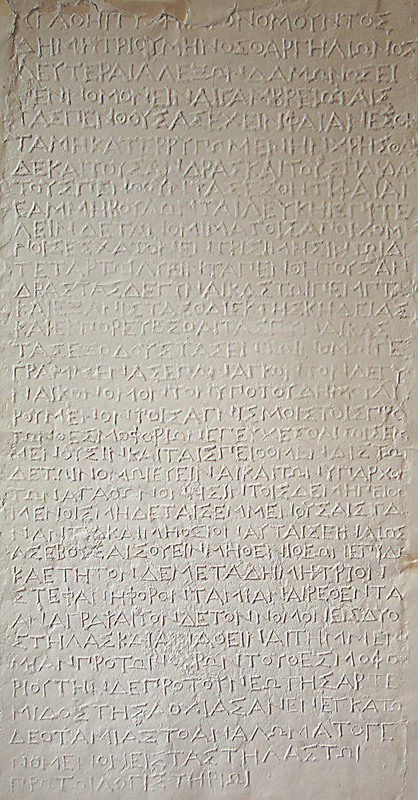 Line 1: Read by Kontoleon, but no longer visible on the stone. Line 2: The phrase may be restored as a common one on Chios, cf. also CGRN 36 (etc.) and here also line 13. It is usually interpreted as referring to "offerings from which one makes smoke", in other words incense or some aromatic wood to be burnt (cf. LSJ s.v. θύον I-II; cp. also θύος). Since the phrase occurs as a part of lists of perquisites (cf. again line 13 and other instances from Chios), it is unclear exactly how incense could be taken away by the priest after the sacrifice itself: perhaps the incense or wood was not completely incinerated, and some portion of it might then remain the priest's property. Line 5: Cf. Matthaiou's discussion of the term to be restored here. There are two possible verbal forms, προϊεράομαι and προϊερατεύω, which are more or less tantamount to the same expression: "to offer sacrifice on behalf of someone else" (LSJ s.v. προϊεράομαι II). Lines 6-7: As SEG comments, "Apparently when a foreigner wished to sacrifice, he first asked the priest to perform the sacrifice; if the priest declined to do so, another citizen performed it". Accordingly, the following restoration might be envisaged: [ἐξ]ε̑ν[αί τινα τῶν ἀστ]ῶν προϊ[ρητεύειν]. The law concerning Heracles, cf. CGRN 50, lines 10-12, makes the meaning quite clear: ἐὰν δ[ὲ ὁ] | ἱερεὸς μὴ παρῆι προιερη[τευ]|έτω τις... In both cases, the priest may still have received the same perquisites (cf. lines 7-10). Line 9: The tongue is very commonly found as one of the prime priestly prerogatives on Chios, cf. e.g. CGRN 36, lines 2-3, and see Lupu NGSL p. 310; but it is also found elsewhere. Lines 12-13: Lists of portions of meat on Chios also habitually contain this sort of phrase: the entrails "placed in the hands" or "on the knees", or both. These have correctly been interpreted as parts of the entrails which were offered to the god and deposited on the hands and knees of his statue, at least temporarily, and much like offerings placed on the table. They could then be taken away as a choice portion by the priest, cf. also CGRN 36, lines 4-6, and CGRN 88, lines 2-3, for further instances. CGRN 41, l. x-x (http://cgrn.philo.ulg.ac.be/file/41/).